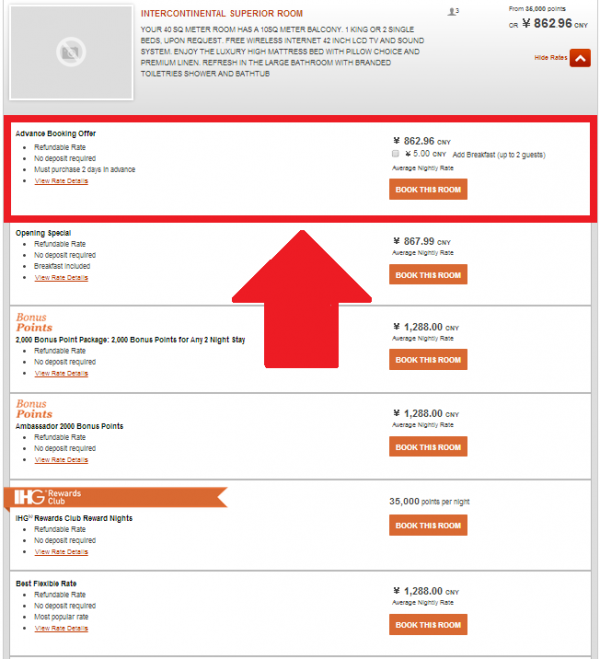 IHG Rewards Club has extended the 30% off “Mini-Group Sale” rate promotion for stays in China until June 30, 2014. You need to book at least two days in advance and two rooms to be eligible for 30% discount off of the Best Available Rate. Note that this offer does not apply for stays at Holiday Inn Express or InterContinental Hong Kong hotels. There is no need for credit card guarantee and the rate is not prepaid. Seems that the “Advance Booking Offer” is another name for this “Mini-Group Sale”. It discounted the BAR at this hotel but more than 30%. Hotels in China tend to have high Best Available Rates that they generously discount (a lot) for corporate accounts and tour groups. This is one rate offer worth checking if you need two rooms and can book at least two days in advance. ‘The Advance Booking Rate’ and ‘Advance Booking with Breakfast’ is available for a minimum of two consecutive nights at participating hotels in China. Guests and members who book ‘The Advance Booking Rate’ and ‘Advance Booking with Breakfast’ must book two full days (48 hours) prior to date of arrival. Customers who successfully book with Advance Booking Rate will enjoy room rate discount with no pre-payment or credit card information requirements. The rates are subject to time and rate changes. The final price is subject to the final booking. ‘Mini-Group Sale’ applies in InterContinental®, Crowne Plaza®, Hotel Indigo®, Holiday Inn® hotels in Greater China and IHG® Rewards Club member only; Holiday Inn Express® and, InterContinental Hong Kong will not be included. ‘Mini-Group Sale’ require same day check in and check out at least 2 rooms in one hotel and should be one guest to settle all rooms charge at the same time; Credit card guarantee is required if book 5 rooms or exceed. ‘Mini-Group Sale’ applies to bookings from now till 23:59hrs 27 June 2014 (GMT+8) and valid for stays till 30 June 2014 (black-out dates may apply) Guests and members must book at least two full days (48 hours) prior to date of arrival. All rates apply to per room per night and qualify for earning IHG® Rewards Club points or airline miles. Tax and service charges may apply. Rollaway bed is not available in Holiday Inn Express® and all rates are including free breakfast and room Internet. From now on, China IHG® Rewards Club members who book the Advance Booking Rate or Advance Booking with Breakfast or Mini-Group Sale Rate via any IHG official website or mobile WAP site (cn.ihg.com; ihg.com; intercontinental.com; crowneplaza.com; hotelindigo.com; holidayinn.com; hiexpress.com) or central reservation office and complete their stay between1 April and 17 June, 2014 will be entered in a weekly lucky draw. From 1 April 2014 to 17 June 2014, 2 winners will be drawn every 7 days. Each winner will receive 100,000 IHG® Rewards Club points redeeming any available IHG hotels globally (minimum 2 room nights). There will be a total of 11 lucky draws and 22 winners. From now on, China IHG® Rewards Club members who book the Mini-Group Sale Rate via central reservation office or hotel reservation office and complete their stay between 1 April and 17 June, 2014 will be entered in an extra weekly lucky draw. From 1 April 2014 to 17 June 2014, 3 winners will be drawn every 7 days. Each winner will receive CNY800 Amazon gift card. There will be a total of 11 lucky draws and 33 winners. All winners mentioned above will be notified by email or phone within 7 work-days after being drawn for information verification and prize delivery. All contact details are based on the record in member profile. Any incorrect or missing information could lead to failure of contact, which might be deemed as the forfeit of prizes by winners. Other terms and conditions may apply and may change without notice. Subject to standard IHG®Rewards Club Membership and InterContinental® Hotels Group Terms and Conditions. InterContinental Hotels Group reserves all rights.